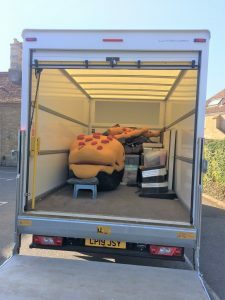 So we say goodbye to Audrey 2 as she wends her way home to Twickenham – next stop for her we hear is Scotland! What can you say about the TATS production of Little Shop of Horrors,directed by Kate Brewster with dad Tim as musical director. Fabulous, stupendous, unbelievable, fantastic, professional, just a few of the superlatives provided by some of our audience over the week. Many congratulations to all the cast and crew for a stunning show. Just in case you missed it here’s a glimpse of what you missed – just click on the picture. My first visit to Turvey to see a TATS show and what a great evening it was. Some old familiar names and faces from other productions around the district and some promising new ones as well. Director Kate Brewster had certainly gathered together a very competent cast and crew for this one. The stage was basically a simple affair with blacks depicting the inside of the florist shop on Skid Row, with a shop counter stage right and a virtual doorway stage left. The band being positioned stage left but partially hidden by the front tabs. On the forestage left, a dustbin surrounded by full black bin liners out of which emerged a down and out drunk during ‘Skid Row.’ Very neat touch. A transparent gauze which divided the stage to shut off the florist shop and play scenes on the forestage was used to great effect especially when back lit to silhouette the backing singers in various numbers. Another inspired touch and great use of scenery. Lighting by Lloyd Gray needs a special mention as, apart from being well designed was some of the most spot on cueing I have yet seen in amateur theatre, it was almost millisecond perfect. That said some of the ‘movable props’ (AKA actors!!) did still occasionally manage to position themselves in the wrong place. Sound by Phil Pickwick was also well balanced and pitched at just about the right levels and pretty much crystal for a village hall. 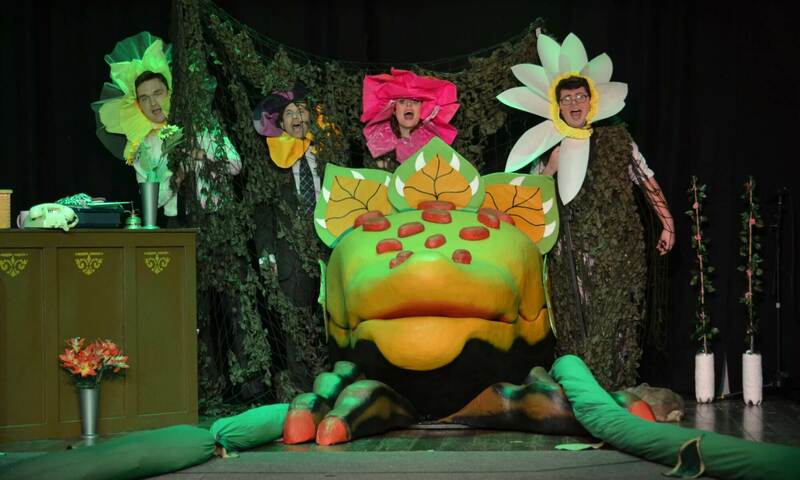 The brilliant props and puppets were mainly supplied by The Really Youthful Company who only specialise in The Little Shop of Horrors, with additional items by Jan Oxford and Jan Clemens. The programme by Kate Brewster was a very well designed piece of artwork. I’ll enter it into programme competition but the indistinct NODA logo on the front page may let it down. Need to use a clear concise logo with ‘Inspired by Amateur Theatre’ clearly visible guys. Shame. Choreography by Tara Hutchings was extremely well done with a very well drilled cast and some excellent slick routines. The band led by MD Tim Brewster on 1st Keys were, as described in the programme, a very professional and tight outfit as I have come to expect from such quality musicians as Andrew Longland-Meech for once not being MD but on 2nd Keys, accompanied by Danny Barton on Guitar, Tom Chaplin on Bass and Dan Wild on Drums. Nice job guys! Charlie Hammond, I am told stepped into the role of Seymour at three weeks’ notice after the original Seymour was forced to quit for medical reasons. I have seen Charlie in several productions, and it doesn’t surprise me that he was able to take over the part and make it his own in such a short period of time, such is his ability and acting prowess. A fine actor indeed who was every bit the consummate Seymour. Leanne Lyndsey White made her return to the stage having lost none of her singing and acting ability playing the part of the abused Audrey, perfectly capturing both her naivety and enthusiasm, although I took a moment or two to accustom my aging ears to her strong high pitched but perfectly correct accent. Paul Wildman, whom I have only come across before in a directorial role, as florist shop owner Mr Mushnik was another excellent piece of casting as the somewhat overbearing businessman quick to jump on the bandwagon of Audrey II. Mark Bryant was a new face in yet another well cast part as the abusive dentist Orin, as well as several other parts. He dragged every ounce of comedy out of the dentist chair scene and I particularly loved his opening as the down and out alcoholic. I don’t know where he has been hiding but I look forward to seeing his considerable talents again in the future. My standout performance however has to be divided three ways, the backing singers, Jasmine Turner (Crystal), Tara Hutchings (Chiffon) and Katie Bannister (Ronnette) just made this show with some very neat and slick routines and particularly their reaction to the action around them. Particularly liked the use of the mini Audrey II puppets in the finale. Clever, high energy stuff, loved it! And finally, the unseen Dean Smith, the man behind the various puppet adaptations of Audrey II, obviously enjoying eating the rest of cast! Kate Brewster certainly made the most of the resources available to her with a very slick production of this old quirky classic, the cast were well rehearsed, the routines well drilled with the band and the technical crew well on top of their game. I have to admit it’s not my favourite musical, but this version kept us very well entertained from beginning to end. A credit indeed to grass roots village hall drama, even if she did cast her net wide of Turvey to achieve it. Well done to one and all.